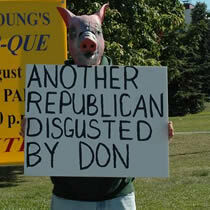 Anchorage, Alaska - Alaska congressman Don Young was heckled by protesters throughout a public picnic he held Monday afternoon in Anchorage. Young is running for re-election and under multiple criminal investigations for bribery and corruption. Young arrived about 2 1/2 hours late to his meet-and-greet salmon bake picnic held near the downtown area of Anchorage. The congressman was heckled from the moment he showed up. About 50 protesters from around the park swarmed his tent and mercilessly shouted "FBI! FBI!" and "The cook is a crook!" About half a dozen supporters of Young were at the picnic and tried to shout down the protesters. The supporters refused to give their names and hid their faces when a camera was pointed at them. Near the end of the picnic, around 20 kids, egged on by one of Young's supporters, started picking up signs and joining the crowd. Most were screaming "Young is Bung." Nobody knew what it meant - including the kids - but it added some laughter to the festivities. The kids also shouted "The cook is a crook! ", oblivious that is was meant for Young. VECO Corp., a company under investigation for bribing Young and other Alaska lawmakers, supplied one of the grills to his picnic, Young's aide said the grills were rentals and will be paid for by the campaign. One of the few comments Young made was after a reporter asked him if he had done anything wrong. Young said "The Lord is with me." 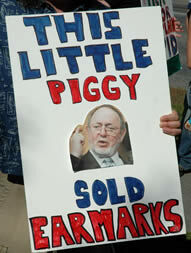 Don Young dances a jig while protesters scream "FBI! FBI!" at him.